Step back to live experiences with O2! There is no doubt that you just can’t beat a live performance when it comes to a music or art based experience. Whether your flavour of choice is Florence or Ed Sheeran, neither sound as magical via speakers as they do when they are in front of you. O2 is highlighting this (as well as their music venues across the country) in their new ad campaign. Of course, it isn’t just about the music. You have sports and other forms of entertainment too. Of course, being from Oxford myself, I am a big fan of following the rabbit. This rabbit is O2 blue though, not quite the Matrix white rabbit! O2 today announces an exciting new advertising campaign, centred on embracing the life-affirming nature of live experiences. The campaign, appearing around the UK from 2nd March, features a bright blue rabbit as the ultimate embodiment of curiosity. Wherever it appears, those who #FollowTheRabbit can find adventure and unforgettable live experiences in music, sport and entertainment. At the core of O2’s campaign is the insight that it’s live experiences that people remember and cherish. It’s the times when they were in the centre of the action, caught up in the moment, part of the crowd that stay with them – opportunities O2 can help customers seize – whether it’s going to see a show at The O2, a gig at one of the 19 O2 Academy venues across the country or access to exclusive tickets and offers through O2 Priority. In the run up to the launch, O2 has been teasing the campaign throughout February, with O2’s rabbit encouraging attendees at The BRIT Awards and England v Italy at Twickenham to share their best live pics with #FollowTheRabbit to win tickets to gigs and events. #FollowTheRabbit will be appearing across a huge range of channels including London Underground, video on demand and out of home spots across the UK. It will also appear on TV during Emmerdale tonight (2March), Gogglebox on 3 March, Ant and Dec’s Saturday Night Takeaway on 4 March, as well as The Jump and The Voice. On the big screen, the ad will appear in front of blockbuster movies including Kong: Skull Island, Logan, and The Fate of the Furious. 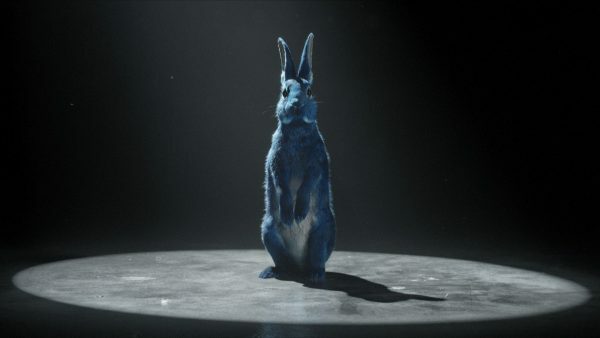 The TV and cinema advert introduces the audience to the blue rabbit as it’s illuminated by a single light in a dark, empty space challenging viewers to follow it into the unknown. Sounds of a roaring crowd can be heard while the camera struggles to keep up as the rabbit darts on and off screen, before racing into a packed out venue. Becoming lost in the crowd, the camera pans up to see a stage –as the roar reaches a crescendo. #FollowTheRabbit will also become a regular presence across Facebook, Twitter and Instagram, encouraging people to get out and experience unforgettable live events. O2 has also recruited a range of social media influencers in sport, music and entertainment who’ll be sharing their own O2 live experiences and encouraging their followers to do the same throughout the campaign. Snapchat users meanwhile will be able to use O2’s first sponsored lens, giving them the chance to literally become the rabbit. And everyone who shares Snaps at O2 Academy gigs will also be able to add an exclusive O2 #FollowTheRabbit filter to their Snaps. Thousands of tickets to live events across the country will be available to customers via O2 Priority, including an exclusive partnership with Merlin Entertainment to give O2 customers and their families’ early access, discounts and offers to top UK attractions including Alton Towers Resort and LEGOLAND® Windsor Resort throughout March and April. O2 will also be placing a number of six foot tall rabbits at a secret location in London on Friday 3rd March and across the UK throughout the month, with hints to their location on #FollowTheRabbit. Those lucky enough to find the rabbits and snap and share a picture will be able to win money can’t buy experiences, while those who can’t get down to meet the rabbits face to face can also enter to win tickets to gigs by interacting with them through social media instead. Finally, O2’s stores will also receive a makeover to feature O2’s rabbit in a range of new impactful window creative executions. “Life doesn’t come with catch up and through our new campaign we want to demonstrate how everyone with O2 can have unforgettable live experiences. Building on our ‘More for you’ platform, #FollowTheRabbit taps into the natural curiosity that we all have to seek out and do new things.